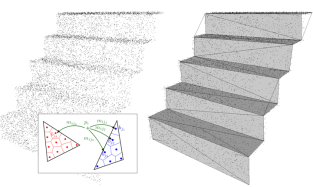 Abstract : We introduce a robust and feature-capturing surface reconstruction and simpli cation method that turns an input point set into a low triangle-count simplicial complex. Our approach starts with a (possibly non-manifold) simplicial complex ltered from a 3D Delaunay triangulation of the input points. This initial approximation is iteratively simpli ed based on an error metric that measures, through optimal transport, the distance between the input points and the current simplicial complex|both seen as mass distributions. Our approach is shown to exhibit both robustness to noise and outliers, as well as preservation of sharp features and boundaries. Our new feature-sensitive metric between point sets and triangle meshes can also be used as a post-processing tool that, from the smooth output of a reconstruction method, recovers sharp features and boundaries present in the initial point set.